WILD ABOUT HARRY: Is this the doctor who first diagnosed Houdini? An original photo of a man identified as Leo Dretzka has appeared on eBay. 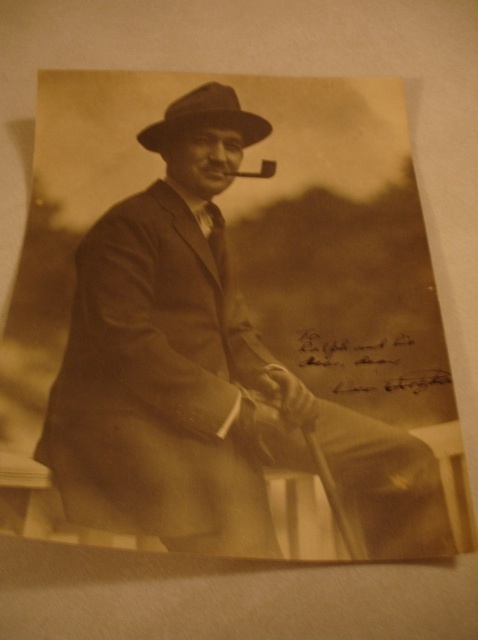 The seller speculates that this might be Dr. Leo Dretzka, the doctor who first examined the ailing Houdini when he arrived in Detroit in October 1926 for what would be his final performance. Dretzka examined Houdini on the floor of his dressing room at the Garrick Theater. Houdini's obituary would later record that Dr. Dretzka diagnosed the magician as suffering from appendicitis and gave him the choice of performing that evening or going to the hospital. I've always thought it odd that a doctor would let a patient experiencing symptoms of acute appendicitis for several days decide if he wanted to go to the hospital or not, but that's what the record says. Dretzka was actually the first of several doctors to attend to Houdini that tragic day. After Houdini struggled through his performance at the Garrick, he still refused to go to the hospital and instead returned to the Statler Hotel. There he was examined by the hotel physician, Dr. Daniel Cohn, who was substituting for the regular hotel doctor at the time. The young Cohn called staff surgeon at Grace Hospital, Dr. Charles Kennedy, who arrived at the hotel at 3AM and actually misdiagnosed Houdini with either a "ruptured intestine or a clot in the large blood vessel feeding it" (this according to Houdini!!! The Career of Ehrich Weiss). This was partially based on the information that Houdini had been punched in the stomach in Montreal. Only after Houdini spoke on the phone with his own physician in New York, Dr. William Stone, did he finally agree to go to the hospital. The next day Kennedy and his team of surgeons discovered that Dretzka's diagnosis had been the correct one. Nevertheless, it was too late as Houdini's appendix had already ruptured, most likely on the train ride to Detroit. I can't say with any certainly that this is a photo of the Dr. Dretzka. But I guess it could be! The auction starts at $25 and can be found HERE. UPDATE: Our good friend melbo (Silly Tart) has uncovered another photo of Dr. Dretzka in The Milwaukee Journal. Certainly looks like it could be the same man! She has also discovered via ancestry.com that he worked at St Mary's and the Detroit Receiving Hospital and died in 1930. Good work melbo! Good find - interesting too if anyone could confirm for sure that that is him. You know, I wonder if Dretzka really diagnosed appendicitis in the dressing room or if he, like Kennedy, was thrown by the punch information and diagnosed something less urgent and life threatening. You'd think Houdini would have gone to the hospital instead of performing if he knew how urgent it was. He certainly would have gone after the show. Of course Dretzka would tell the papers later that he gave Houdini the correct diagnosis, but did anyone besides Houdini hear it? Bess was probably three sheets by then. It's curious. Very interesting stuff. Only one correction: this is not a cabinet card. It is an albumen paper print. Cabinet cards were stiff because they were backed with cardboard and of a different standard size than this image. Ah, thank you, lisby. I called it a cabinet photo because the seller did. I should have known better. I'll zap the word. Thanks. Everything about Houdini's death is strange, not least his own behavior. It's not as if he never went to doctors or missed engagements earlier in his life. Why would you have to talk someone who is in excruciating pain into going to a hospital? I think we've done this seller a favor. It's already received 9 bids. It's going to be interesting to see what this sells for in the end. Cool - wondered how it went.